ELKHART LAKE, WI. Coming off a pair of season-best performances in the last two IMSA race weekends, a combined entry of eight Mercedes-AMG GT3 and Mercedes-AMG GT4 competitors will be looking for a third-straight Mercedes-AMG Motorsport Customer Racing IMSA race weekend victory in the Continental Tire Road Race Showcase at Road America, August 3 – 5. The Road America weekend features both Round 7 of 11 GT Daytona (GTD) races in the 2018 IMSA WeatherTech SportsCar Championship this Sunday as well as Saturday’s featured IMSA Continental Tire Sports Car Challenge race. Ben Keating and Jeroen Bleekemolen co-drove the No. 33 Mercedes-AMG Team Riley Motorsports Mercedes-AMG GT3 to the first IMSA WeatherTech Championship GTD race win of the season two races ago at Canadian Tire Motorsport Park (CTMP). 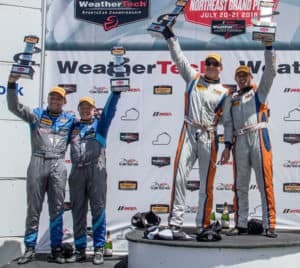 In the most recent IMSA race weekend at Lime Rock Park two weeks ago, co-drivers Owen Trinkler and Hugh Plumb scored a breakout IMSA Continental Tire series victory in the No. 46 TeamTGM Mercedes-AMG GT4. The No. 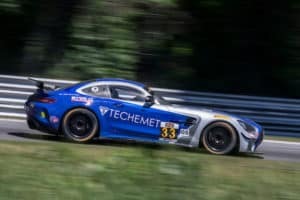 46 team’s overall and Grand Sport (GS) class victory was the first race win in North America for the Mercedes-AMG GT4 and the first for TeamTGM in the IMSA Continental Tire series. Both race-winning teams come to Road America as the highest-ranked Mercedes-AMG Motorsport Customer Racing competitors in their respective series championships with just four race weekends remaining on the 2018 IMSA schedule. Keating, Bleekemolen and the No. 33 are currently third in the IMSA WeatherTech GTD driver and team championship standings with 194 points. Mercedes-AMG is third in the GTD manufacturer championship standings with 200 points. Keating, Bleekemolen and the No. 33 Riley Motorsports team are two-time IMSA GTD winners at Road America, with victories in 2015 and 2016, while Bleekemolen is the winningest active driver on the four-mile Wisconsin track. His five career wins include the back-to-back victories with Keating and the Riley team and three American Le Mans Series (ALMS) GTC wins in 2010, 2011 and 2013. Plumb, Trinkler and TeamTGM saw their milestone win move them well into championship contention in the IMSA Continental Tire series Grand Sports (GS) class point standings. The No. 46 drivers and team are now in a second-place tie, just four points out of first place, 165 – 161, in the GS class rankings. The No. 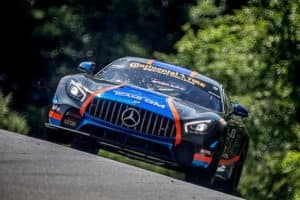 46’s memorable victory anchored a strong showing for the Mercedes-AMG GT4 at Lime Rock, including the initial one-two race finish for the first-year race car in North American competition. Bryce Ward and Indy Dontje improved 15 race positions from 17th on the grid to finish second in the No. 57 Winward Racing/HTP Motorsport entry at Lime Rock. The team will be looking to improve one step on the victory lane podium this weekend at Road America where factory Mercedes-AMG driver Christian Hohenadel will fill-in for Dontje, who has a prior racing commitment in Europe. Another Mercedes-AMG GT4 team bound for Road America after a season-best showing at Lime Rock is the No. 56 Murillo Racing entry of Jeff Mosing and Eric Foss. The co-drivers finished fifth at Lime Rock to give Mercedes-AMG GT4 three cars in the top five. Each of the top-five finishers at Lime Rock is part of two-car Mercedes-AMG GT4 teams. Plumb and Trinkler team with Ted Giovanis and Guy Cosmo who co-drive the No. 4 TeamTGM entry, Ward and Hohenadel compete in partnership with the sister No. 33 Winward Racing/HTP Motorsport car of Russell Ward and Damien Faulkner, and Mosing and Foss run under the Murillo Racing banner with the similar No. 65 entry of Tim Probert and returning team driver Brent Mosing. 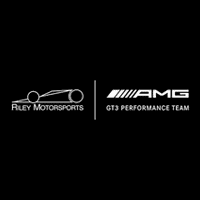 Ramsey Racing, which gave the Mercedes-AMG GT4 its first pole in North American competition at CTMP, is entered at Road America with season-long co-drivers Mark Ramsey and Alexandre Premat. A three-day weekend event, the Continental Tire Road Race Showcase at Road America begins today with practice for both the IMSA WeatherTech Championship and IMSA Continental Tire series. Saturday starts with morning practice sessions for both series to set the stage for IMSA Continental Tire GS qualifying from 11 – 11:15 a.m. CDT and IMSA WeatherTech Championship GTD qualifying from 12:35 – 12:50 p.m. CDT. Saturday’s schedule wraps up with the Road America 120 two-hour IMSA Continental Tire Series race, which is scheduled to start at 4:05 p.m. CDT. Sunday features the IMSA WeatherTech Championship Continental Tire Road Race Showcase main event at 1:35 p.m. CDT. The two-hour and 40-minute race will be preceded by a 20-minute final warmup session earlier on Sunday at 8:30 a.m. CDT. Live coverage of the IMSA WeatherTech Championship Continental Tire Road Race Showcase begins on FOX Sports 1 (FS1) this Sunday, August 5, at 2:30 p.m. EDT/1:30 p.m. CDT.